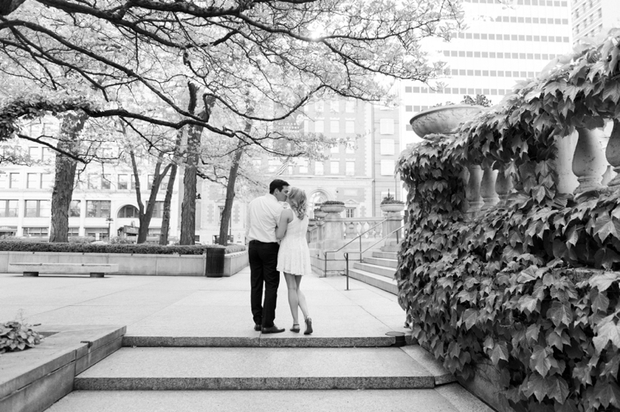 I am so thrilled to share Mallory & Brien’s downtown Chicago engagement session with you today. And not just because these two are adorable but because I have known Mal most of her life. She and her family lived three houses down from us in good old Edison Park, part of Chicago’s Northwest side. She was the little sister of my friend, also named Tara, and the three of us used to play together as kids. Our favorite activities were playing office, having lemonade stands, making up our own games that took us all around the neighborhood and frequenting Moretti’s Ristorante for chicken fingers and fries. Mal was the cutest kid. I was lucky enough to be her “Big Sister” (a Catholic school thing) when she was in 2nd grade, I in 8th. It has been a pleasure watching her grow up and a privilege to be able to document her recent engagement to a wonderful, kind & sweet man. My time with Mal & Brien was so lovely. They clearly adore each other, that much is obvious. Hearing the story of how they met, fell in love and are now dating long distance while Mallory is in P.A. school in Boston was very sweet as we strolled through the Art Institute Gardens and alone the Chicago lakefront. Wishing these two a lifetime of love, health & happiness.